Photo by Kami, April 2010. Hellebore (Helleborus). Hellebores are among the first blooms we see in the Seward Park Garden. Sometimes referred to as ‘Christmas Rose’ or ‘Lenten Rose’, hellebores are the stars of the late winter/early spring garden. Plants generally bloom between December and March in cultivation, though some begin earlier, and others continue into April and May, particularly in gardens with colder spring climates. Hellebores are easy to take care of, with the only maintenance required in early spring or summer, depending on the gardener’s preference. 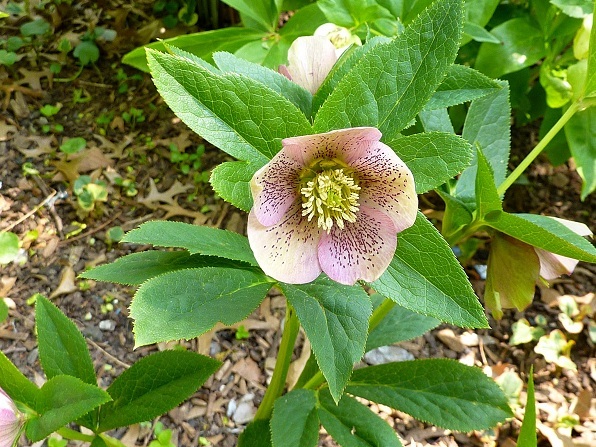 In early spring, hellebores put up both their flowering stalks and their foliage. The previous year’s foliage tends to be rather unattractive by springtime, and can be removed (using pruners or scissors) without causing harm to the plant. Removing the previous year’s foliage will also help show off the flowers. Hellebores are dormant during the summer months, and should be left alone. If the previous year’s foliage was not removed in the spring, it can be removed at any time. However, it is important to keep in mind that hellebores only put out new leaves in the spring, so severe cutbacks during the summer may cause harm to the plant. Hellebores should not be cut back in the fall, as they continue to draw energy from their leaves over the winter. If the plant is covered by fallen tree leaves, these should be removed.